Temple of Lall Deo, Bishnupur. bl.uk > Online Gallery Home	> Online exhibitions	> Asia, Pacific and Africa Collections	> Temple of Lall Deo, Bishnupur. 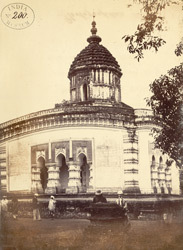 Photograph of the Temple of Lall Deo in Bishnupur, West Bengal from the Archaeological Survey of India Collections: India Office Series, taken by Walter Campbell in c. 1868. Bishnupur is renowned for its terracotta temples that were built from approximately the 16th through to the early 20th centuries. Terracotta temples are not confined to Bishnupur, they appear in other areas of Bengal as well. The walls are covered with reliefs carved on terracotta tiles and plaques. The typical architectural style of Bishnupur temples consists of a single tower on top of a roughly square structure with a curved roofline, somewhat reminiscent of rural Bengali huts, as can be seen in this view.